Monday September 10, 2018 - Self proclaimed National Resistance Movement (NRM) general, Miguna Miguna, has claimed that National Media journalist, Barrack Oduor, should be treated as the main suspect in the murder of University of Rongo student, Sharon Otieno. According to Barrack Oduor’s version, he was abducted together with Sharon in Migori town but he escaped by jumping out a moving vehicle at Nyangweso market on Homa Bay-Kisumu Road. 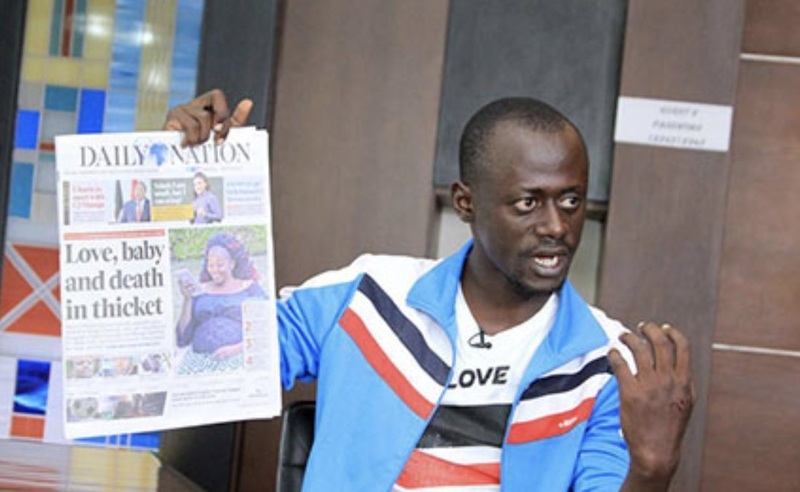 The journalist said he took the daring step when he felt that his fate had been sealed after the abductors bundled him into a car with tinted windows and drove off at a high speed. But according to Miguna Miguna, Barrack Oduor’s story is not adding up because you cannot jump out of a speeding car and get knee injuries only. Here is Miguna Miguna’s take. “If anybody jumps out of a vehicle being driven at 100 KMs per hour, he does not land on his knee. He lands on his head or neck and shoulders. He will have broken ribs, bones and possibly a broken neck. Not bruised knees. The Barrack Oduor story is for monkeys with IQ of 50,” Miguna said on Sunday. “If Barrack Oduor, a small man, was "sandwiched" between two men in a four wheeler, one of the men would have fallen out with him as he "jumped." Did the "men" shoot at him? Why not? More significantly, where was Sharon Otieno in the vehicle? We need the TRUTH. Not lies,” Miguna added.